What are you going to tumble? Where you will run the tumbler? How much rock you will be processing? Are you willing to glue a tumbler to a block? We have videos showing each of these tumblers in operation. You might want to watch them to see the basic differences between the tumblers before you start reading the review below. In the sections below we will compare these tumblers on a number of features. The UV-10 has a barrel that will process about 8 pounds of rock at a time. 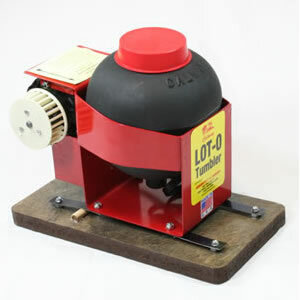 The Lot-o-Tumbler Single will process about four pounds of rock. The Lot-o Twin will process about eight pounds. If you don't have enough rocks to fill the Lot-o Twin or the UV-10 to recommended capacity then you will need to add ceramic media or some previously tumbled stones that could use improvement. They do not work properly at less than recommended capacity. These tumblers have similar size motors so their electricity consumption will be about the same per hour of operation. However, if you run the UV-10 or the Lot-o Twin your electricity costs will be 1/2 as much per pound of rock produced compared to running the Lot-o Single. This is the Lot-o-Tumbler Single. It is designed to tumble about 4 pounds of rock. Belt Inc. also manufactures a Lot-o-Tumbler Twin with two four-pound barrels. Both of these tumblers use about the same amount of grit and polish per pound of rock. Both of these tumblers are easy to use and clean except for one thing. Getting the amount of water right. One of the main reasons we made the two videos linked to above was to demonstrate how to get the right amount of water in the barrel. The rocks should be wet enough for the grit to stick but not so wet that the grit slides off. There should be no standing water in the bottom of the barrel. Both of these tumblers require about the same amount of time for processing a load of rock. The fine grit and polishing steps take one or two days each. The amount of time spent in medium grit (coarse grit is not used in a vibratory tumbler) depends upon the type and shape of the rocks that you are starting with and how much smoothing you want them to have. This video demonstrates the operation of the Thumler's UV-10 vibratory rock tumbler. The Lot-o-Tumbler has a set-up challenge. That is getting a concrete block, painting it, then gluing the tumbler to the top of the block. To have a more stable base, we filled the holes in our concrete block to increase its weight to about 60 pounds. And, we used GOOP to glue the tumbler to the block. Honest! This is the deal-breaker for most people. The Lot-o-Tumblers have rubber bowls and that allows them to run with mainly noise from the motor. The UV-10 is louder because it has a hard composite bowl and the rocks vibrate against its walls. If you are tumbling small rocks under an inch in size the amount of noise from the bowl will be small. However, if you are tumbling larger rocks they will hammer against the bowl and that is where most of the noise is produced. I live in a two-story wood-frame house with garage below the bedrooms. I would not run either of these at night because I would hear them upstairs. I do run the Lot-o all day and don't notice it upstairs, but the noise of the UV-10 would be disagreeable in some parts of the house. At our warehouse we run the Lot-o and barely notice. The UV-10 is noticeable and disagreeable if you have to work near it. Check out our UV vibratory tumbler guide to learn a couple of tricks to reduce the noise level of Thumler's UV-10 tumbler. This video demonstrates the loading and operation of the Lot-o-Tumbler Single. 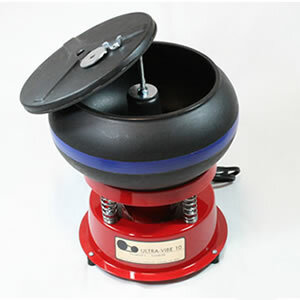 The UV-10 can process larger rocks. We have tumbled rocks up to about 4x3x2 inches (three or four rocks this size can be added to a batch of small-size material < 1" diameter). LOTS of small size material is REQUIRED for padding or the big rocks will hammer each other, producing chips, bruises and angular rock fragments that will scratch every other rock in the batch. The Lot-o barrel has a round opening about 2 1/4" in diameter. A couple rocks nearly that size can be run if the rest of the load is < 3/4" material. Small size material is always required to cushion large rocks and deliver grit to their surfaces. How Easily Can the Rocks Be Checked? The UV-10 is better. You can remove the lid while the tumbler runs and watch all of the rocks churning in a well-illuminated tumbler bowl. The Lot-o-Tumbler has a deep barrel with a small opening at the top. You can only see a few rocks at a time as they churn within the barrel. 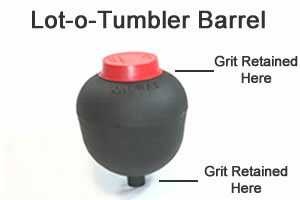 Two parts of the Lot-o-Tumbler barrel are stubborn for retaining grit. One is the small well at the bottom of the barrel. It is hollow and small rocks and ceramic pellets can lodge there along with grit. These can contaminate polishing step. This is so hard to clean without risking damage to the barrel that I have a separate barrel used only for the polishing step. Another area that retains grit is at the top of the barrel where the rough lip has lots of crevasses where grit can hide. This can be scrubbed vigorously with a toothbrush. Which One Produces a Superior Polish? I can get a great polish from either machine. The keys are 1) cleaning the barrel and rocks thoroughly between steps; 2) avoiding any rock that might shed particles or break in the tumbler; 3) not running the rocks in fine grit or polish too long; 4) use ceramic media to help cushion the material and, 5) cleaning the barrel and rocks thoroughly between steps (we know we already told you that one but we repeat it again because it is so important). The Lot-o-Tumbler has a small "well" in the bottom of the barrel where ceramics and small rocks always get stuck - along with mud and grit from the tumbling process. When I first started using the Lot-o I would dig these out with a screwdriver before the polishing step to be sure that grit did not carry into the polishing step. Then I realized that the screwdriver was abusing the barrel. So, now I use a separate barrel dedicated only to polishing. There is also some rough rubber on the rim of the Lot-o-Tumbler barrel that must scrubbed thoroughly with a toothbrush to remove grit between steps. Be sure to scrub the foam pad under the UV-10 lid with a brush and rinse thoroughly before the grit dries. If you allow the grit to dry it will be very hard to remove. I have both of these machines at our warehouse. They are side-by-side in our work area. I almost always run the Lot-o because I prefer to tumble smaller quantities of rock and because of the noise. I use the UV-10 if I have larger rocks or have a larger quantity to process. I would rather clean-up the UV10 for a single run of rocks rather than run the Lot-o Single for two batches (twice as much time required). I would run the UV-10 a lot more if I had an outbuilding where it could run without being heard (as long as the temperature out there is above freezing). Now that you have a lot of information you might make a list of the plus and minus features of each tumbler as it applies to your personal preferences and the type of material that you will be tumbling. That should help you make a good selection.